The photo above shows a group of young boys starting a new life – full of excitement and hope. They had arrived in Australia in 1928. Australia – a land of sand, sea and surf – a land of new beginnings, of opportunities, of hope for so many immigrants. Dozens of Fleetwood folk – hoping for a better way of life – emigrated “down under” in the 1960s. They were the £10 Poms – for £10 was all they had to pay for their fares. Many were homesick, some returned home disillusioned, but the majority carved a life for themselves and started new generations for that vast continent. But it was not all “milk and honey” – thousands of British children had no choice – and around 150,000 were shipped out to Australia, Canada, Zimbabwe in the period from the turn of the century to the mid 1960s. Many were orphans, others separated from their families for various reasons. Often their new lives were hard, lonely and tragic – a travesty of their dreams. Even today many of these “lost” children still search for their roots and their heartbreaking stories hit the headlines. In today’s world it’s hard to understand the policy which sent these children so far away from everything that was familiar. Our picture features a group of young boys heading for Fairbridge Farm School in Western Australia in 1928. They landed in Fremantle and were taken south along the coast to their new home in Pinjarra. 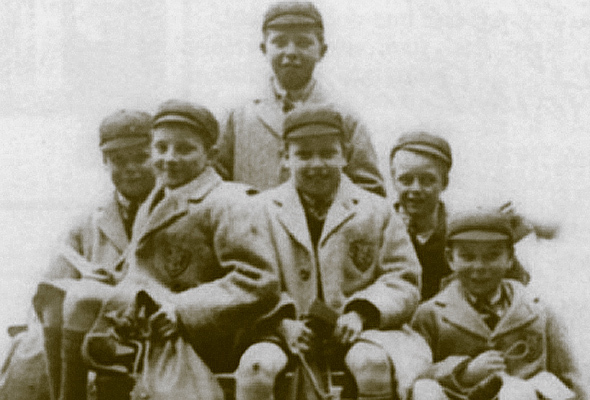 Smartly attired, wearing new coats with a school badge, highly polished boots – and smart caps. Clutching their meagre belongings in kitbags they set out with happiness and hope reflected in their faces. It would be interesting to know what became of these new young Australians. First published in Life in Fleetwood issue 42, autumn 1996.